Last year was a big year for Adventures in Odyssey as the team who brings the stories and characters of Odyssey to life prepared for the 30th birthday of the show. And, now, 30 years into the series, the 64th audio release, Under the Surface, is available from Focus on the Family. Now, more than ever before, Adventures in Odyssey albums are the easiest to obtain than they ever have been. Album 64 is now available on CD and digital download. 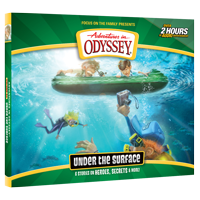 In addition, members of the Adventures in Odyssey Club can stream the album online or via the AIOC mobile app. Learn more about Album 64, Under the Surface, here. Purchasing links also available. Learn more about the Adventures in Odyssey Club. Members are given access to the entire series, and then some! As always, stay tuned. The team who brings you Adventures in Odyssey audio series is always on the top of their game and you never know what to expect next!